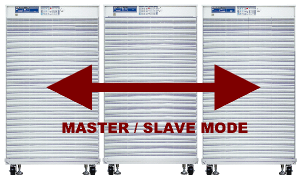 5VP Series Enhanced “A” versions support Master Slave Operation. Irvine, CA, June 20th, 2017 – Adaptive Power Systems Inc. (APS) has upgraded its popular line of high power, programmable DC Loads to support Master/Slave parallel operation. This new capability allows two or more DC Loads to be paralleled to support power requirements that are beyond the range of a single DC load. With individual 5VP loads supporting power levels ranging from 5kW to 60kW each, the ability to operate as either a master or slave, up to eight loads can be paralleled. This new capability easily extends the use of these DC loads into extended range, high power electric vehicle battery test applications. These fully featured DC Loads are targeted at the development and test of battery solutions for advanced electric drive trains. The new 5VP Series of loads incorporate many of the test capabilities found in modern electronic loads and expands upon this by offering a suite of built in battery discharge profile functions. These discharge functions can be customized by the development engineer as needed and executed without the need to develop test software. Data on battery performance can be collected during these test discharge protocols. Sporting a logical front panel layout with large, easy to read displays and a full numeric keypad for parameter entry, the Adaptive Power Systems 5VP Series loads offer intuitive front panel operation for both lab environments or production floor requirements. For automated production test system applications, control interfaces like USB or LAN are supported. The 5VP Series loads are available with 60Vdc, 600Vdc or 1000Vdc maximum input voltage ranges and all models offer dual range capability for enhanced resolution and accuracy. These floor standing cabinet systems are easily deployed using casters for mobility. For additional information, contact Adaptive Power Systems (info@adaptivepower.com) or call toll-free +1-886-517-8400 (US) or +1 (949) 752-8400 for more information. Product information is available at www.adaptivepower.com.